I’m here with a quick post to announce the winners of the January Challenges!! Will the winners please email me at ablognamedhero@gmail.com and specify in your email (or subject line) that you’re a winner (either of the Heroine Badge OR the Gift Voucher). Thank you so much for playing along!! Hello everyone! It’s Michelle here today and I am so excited to be posting. 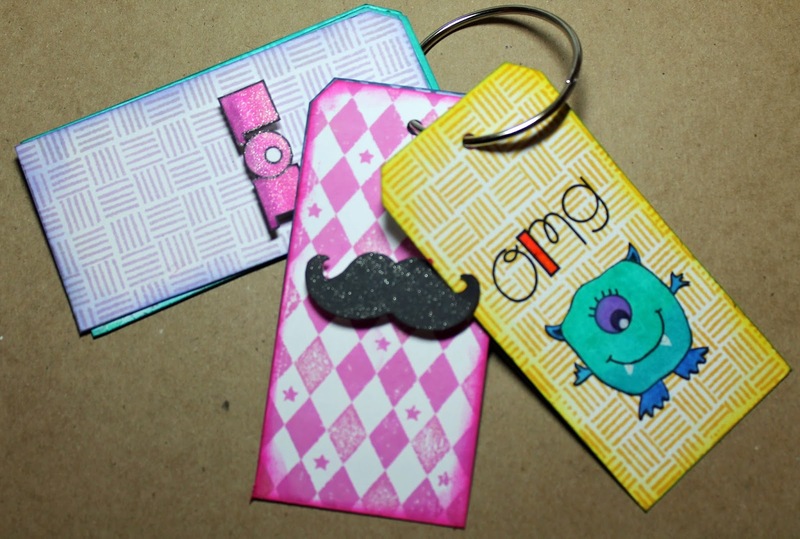 It’s my first solo post of 2014 and my first project for ABNH for 2014! I’m so happy to be back! This year I am going to be doing “home decor/altered items/things around the house” projects on the 23rd of every month (I know we are off a couple days this month… but it’s ok). If you have any suggestions for items you would like to see, techniques etc. please don’t hesitate to ask. I am always open to a challenge! Today I have something small, simple and something all of us can use!!!! 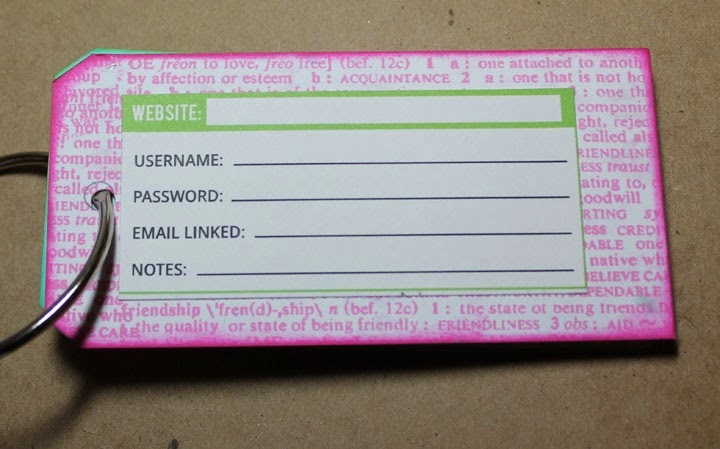 It’s a password book for all those online passwords that you have stuck on little sticky notes all over your desk! 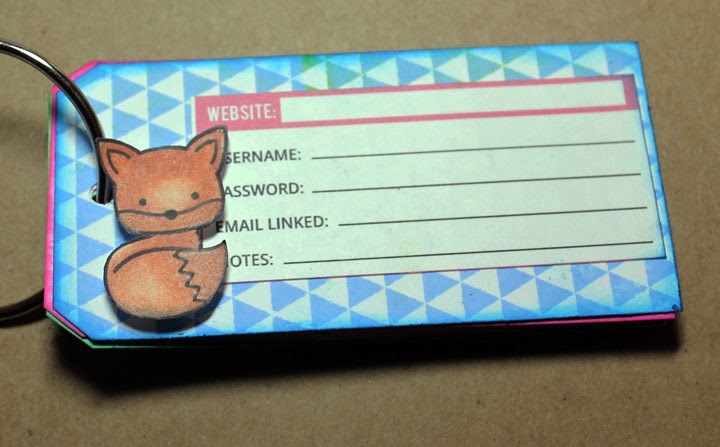 I got so tired of digging through sticky notes I decided to create a book for myself. My daughter loved mine so much she asked me to make her one too. That is what I am sharing with you today. My tags were cut using the Silhouette Machine, a Tag Template from the Silhouette Store, cardstock and really old patterned paper by My Mind’s Eye. I also die cut the letters and covered them in glossy accents. The typewriter is from Paper Smooches. 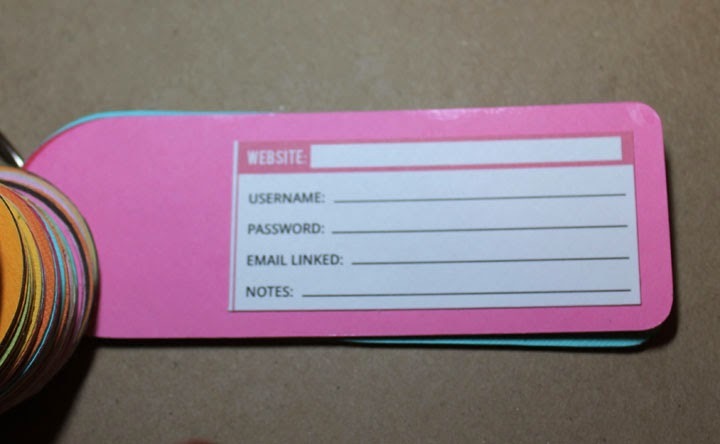 The tag that you write on is a printable. They come on a full sheet with 8 per sheet when you print. I just cut them apart. The link is at the bottom of this post. You just fill in the pertinent information and you always have it on hand. Goodbye sticky note covered desk! You will need tags. I used one tag as a template and fit as many on a sheet of Neenah Solar White Paper as I could. I believe I got 6 per sheet. 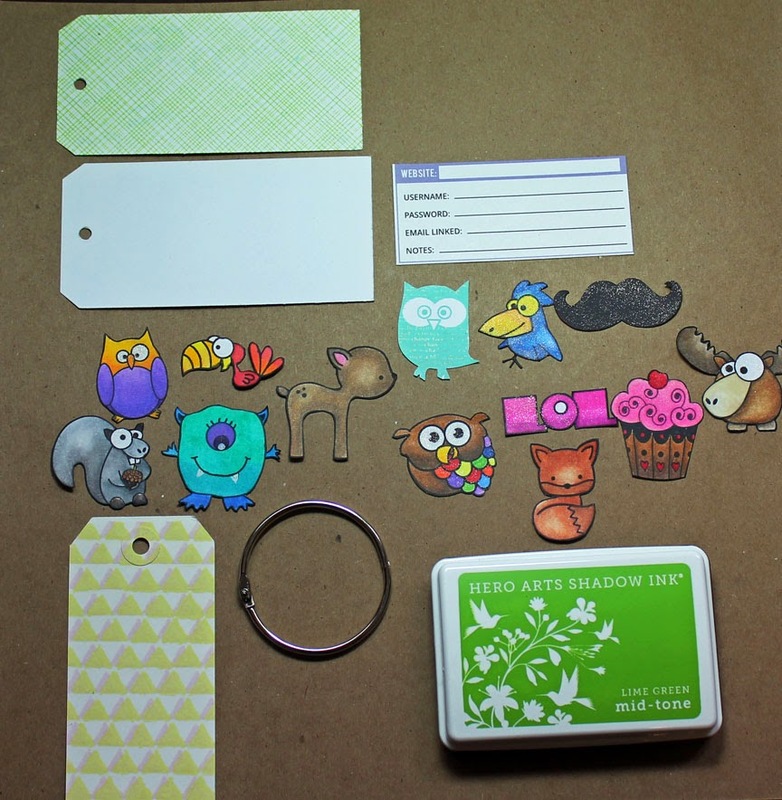 I used Hero Arts Critters, Lawn Fawn Critters and some Paper Smooches too. This part was a lot of fun! 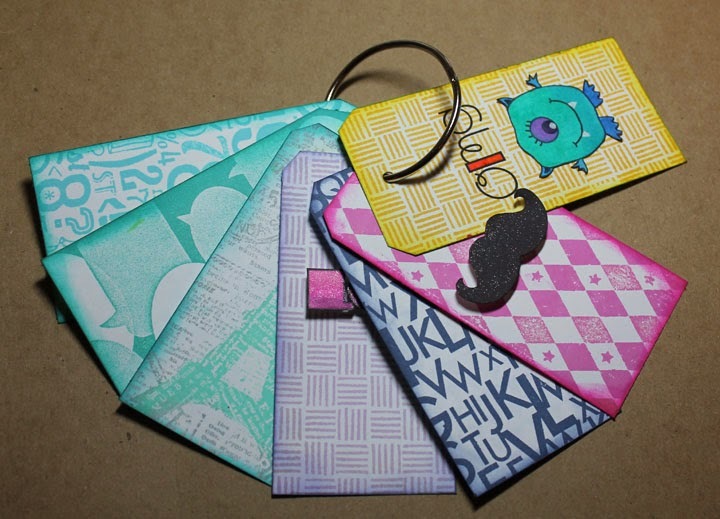 I then stamped the tags front and back with all the fun patterns that she chose. I tried to use my brightest colors. 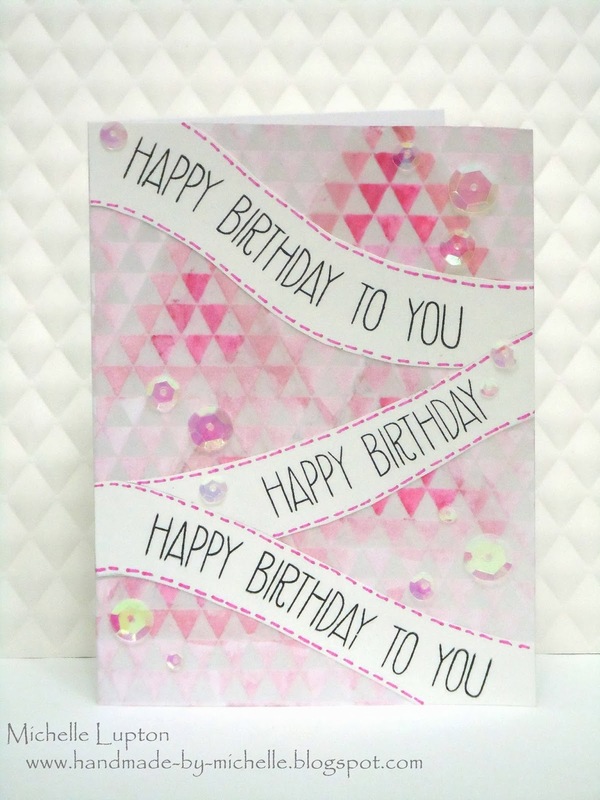 The new Hero Arts Ultra Pink is showcased here along with Simon Says Stamps Sunshine Yellow. Aren’t the colors AMAZING? Love them. My girl is a Pool color girl so there is LOTS of Pool in this batch. 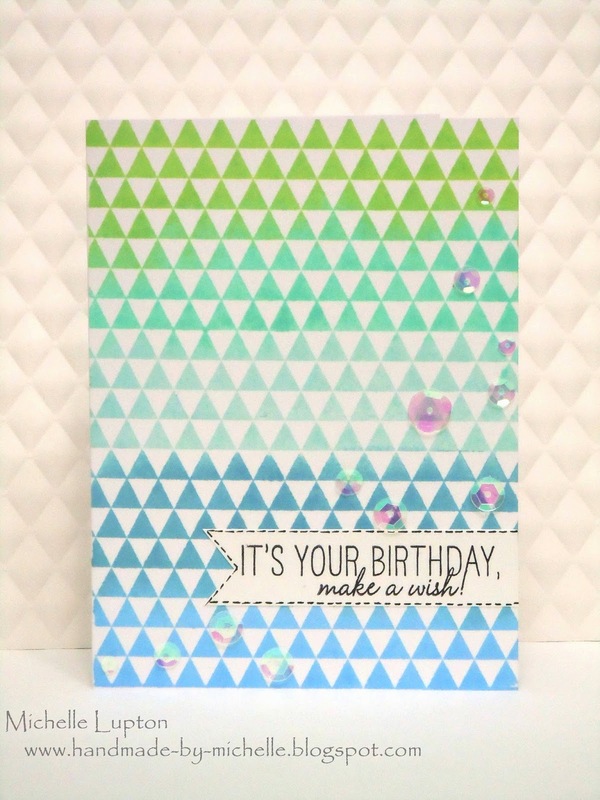 I added on some of the fun shapes that I colored or stamped onto the back with pop dots. Seeing it now, on the screen, I think I will add some fun quotes to go with them too. Really there are no rules you can do whatever you want. You could even use tags that you have tried techniques on etc. The possibilities are endless!! 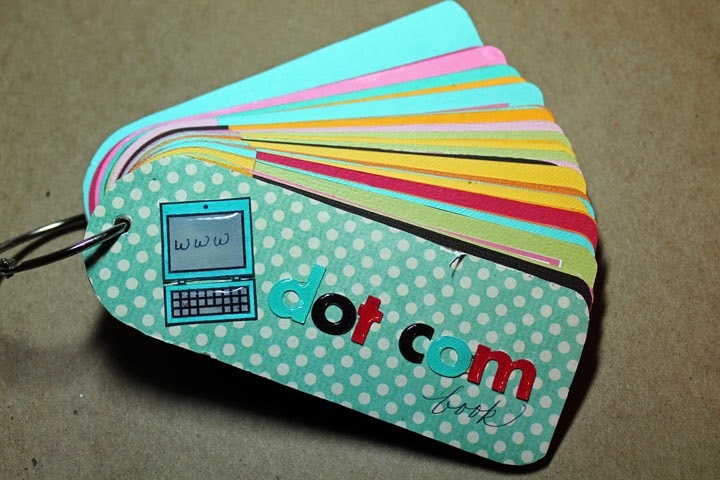 I stamped the front of the cards too and adhered the printables for her. I have a ton of extras printed so that when we run out of tags we can simply create more. It’s so fast and easy to put them together. I even added a Lawn Fawn Critter to the front of this one. And that’s it!!! So fast, so simple and so many possibilities. Thank you for stopping by. Don’t forget there is still time to enter our latest challenge. LINK TO FREE PRINTABLE CLICK HERE! And this is the video. (I’m sorry. I sometimes don’t find the right words and it’s even worse if I have a cold or a flu). Hope your start of 2014 was fantabulous and kicked your mojo! Here is my first post for 2014. And along the year I will be revisiting old supplies and techniques, sometimes using new things to give them a new life, sometimes just reusing or repurposing them so we don’t forget what we already have in our drawers. In the first one I ink my well loved Hero Arts Lotus Background stamp with Versamark ink and used white, gold and copper perfect pearls with a tiny brush and one color at a time, starting with white and taking off the excess after each color with a fluffy brush. For the second card I first stamped lines diagonally through my black cardstock panel (which shows perfect pearl in all its glory), then I colored the lines in gold, copper and bronze colors trying to achieve an ombre effect. After that I inked Hero Arts Large Fabric Design Background with Versamark ink and placed carefully the diagonal cardstock on top, then use a credit card toburnish it and make sure the design really passed to the cardstock. This takes away some of the perfect pearls and lets the design shine through! Literally both desings are so shiny and beautiful eventhough my old camera does not make them justice. Well I want to wish you all a year filled with health, peace and love and all the crafts you can do! Tiny Flags – CASify It!! I recently bought the Tiny Flags background stamp from Hero Arts, so I decided to take it out and see what I could do with it. I wanted to see what I could come up with using the stamp over the entire card base. 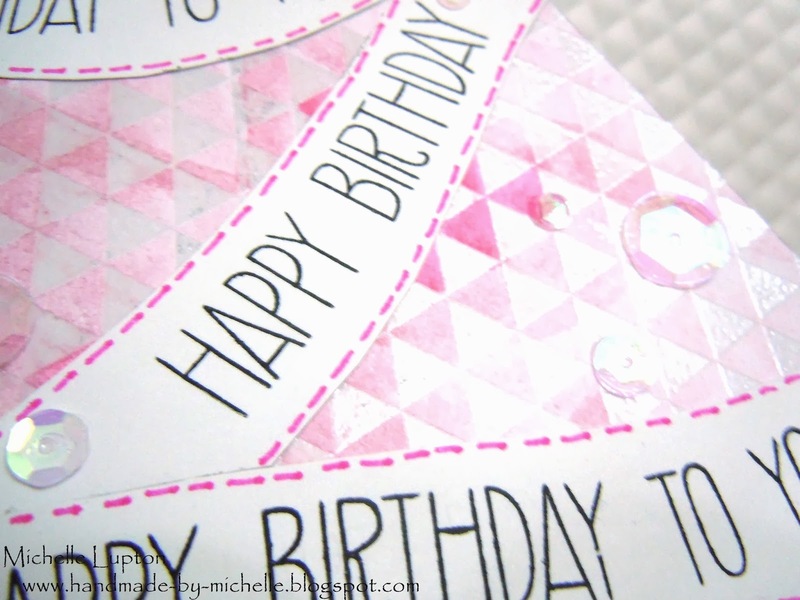 For the next card, I stamped the Tiny Flags background in Versamark and clear embossed, before painting on some pink shadow inks with an aquash brush. I decided I didn’t like the background much, so covered it up with a much bigger banner (I just hand-drew it and cut it out), stamped repeatedly with a sentiment from Avery Elle. 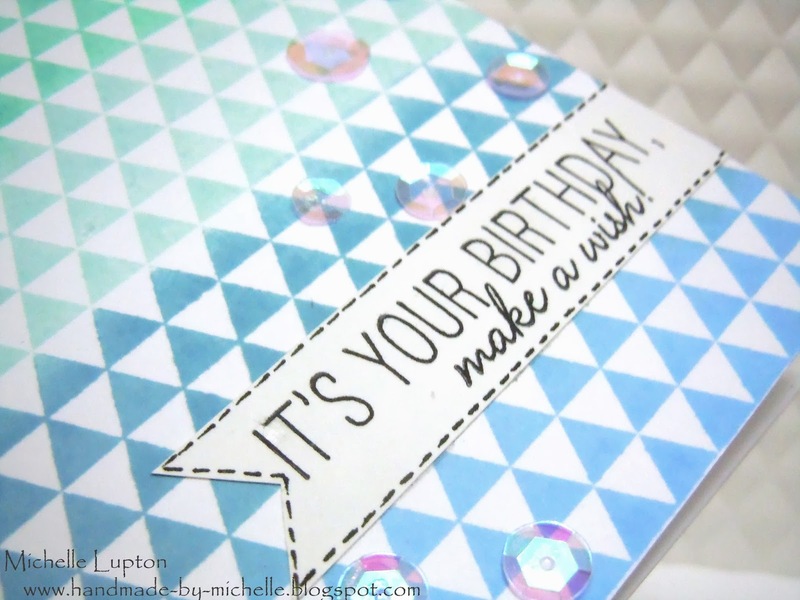 I finished off the card in the same way as the first – faux stitching lines and sequins scattered about. Now, I’d like to introduce a new theme to my posts for A Blog Named Hero – my plan is to do posts like I always have, but then to take something from my post and create a Clean and Simple (CAS) card in the same theme – in other words, take my card and….. I stamped with Versamark and clear embossed, then coloured the spaces with Faber-Castell watercolour pencils, then blended a bit with water. Make sure you check out our latest challenge – there’s still heaps of time to join in!! As always, there’s a voucher from Simon Says up for grabs – now who would not be tickled pink to win that?! !